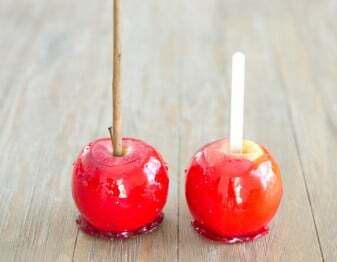 Learn how to make candy apples with us. It’s not hard. It’s actually crazy-easy. Promise! 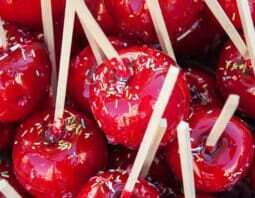 Candy apples – sweet, tart and crunchy. Brilliantly, brightly red. Sooooo shiny. Geez, they’re just plain freaking fun. I’ve included a little bonus below for you. 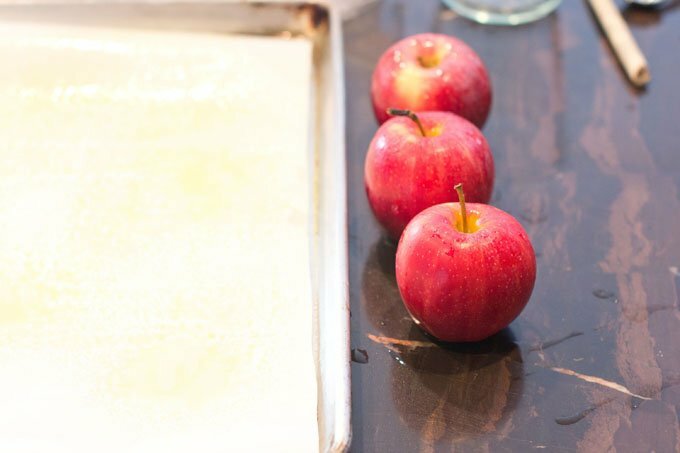 To make your apple bottoms special you pour demerara sugar onto a baking sheet. Set the wet candy-covered apples down in it. It gives the bottoms of the apples this cool sparkly look. You can even mix some pumpkin spice in with the sugar for some Fall flavor too. In a heavy-bottomed saucepan mix together 2 cups sugar, 3/4 cups water, 1/2 cup light corn syrup, 1/2 teaspoon red food coloring (I use the gel kind, like this) and 1/2 tsp. cinnamon extract (optional). The mixture will be bright red like this. Set up your candy thermometer so that the tip is in the mixture and is not touching the bottom of the pot. Put it over high heat and bring it to a boil. Leave it bubbling on high. It’ll look like this. You keep letting it bubble like that on high until it gets to be between 300ºF and 310ºF. You’re going to do some other stuff while the mixture is heating, but beware! It might seem like it’s taking forever to heat but once it gets to the 230ºF everything speeds up. So keep your eye on it while you’re multi-tasking. The whole thing will take around 20 minutes. 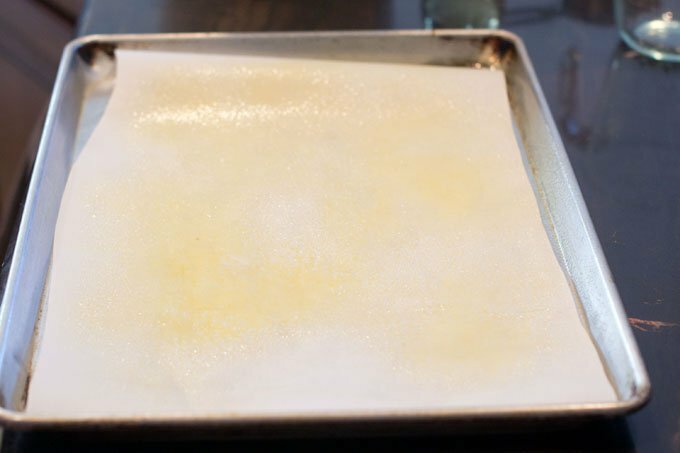 While the sugar mixture is coming to temperature, line a baking sheet with parchment paper and spray it with baking spray. This is so your hot candy doesn’t stick while it’s hardening. Get your sticks ready. I’m using some twigs here. Here are some other ideas for sticks. 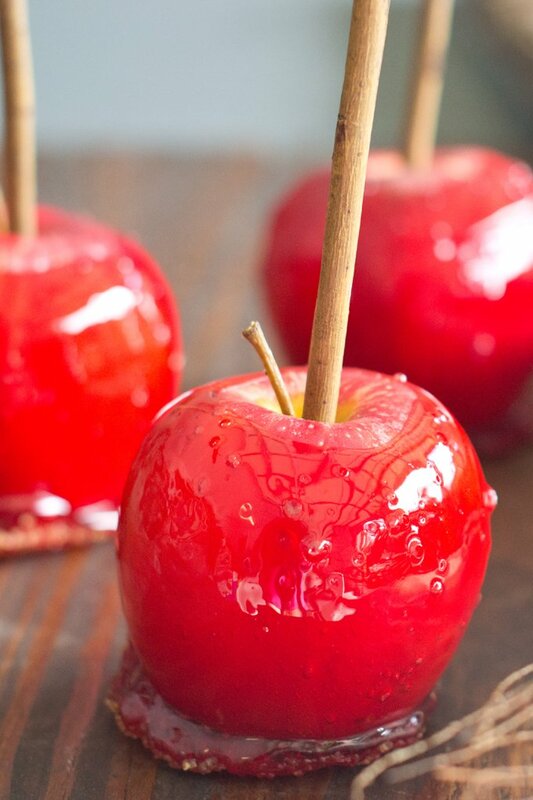 You can also get specialized sticks that are just for candy apples online here. Stick the sticks down into the tops of the apples. You want to get a good ways in. If your sticks are long, go all the way but not through the other end. If they’re shorter, getting halfway into the apple is good enough. Mix together 1/4 cup demerara sugar and 1 teaspoon pumpkin spice (you can leave out the pumpkin spice if you want. What’s crucial is the sugar). Sprinkle the sugar mixture onto your prepared pan. When your candy mixture is at 310ºF, take it of the heat. 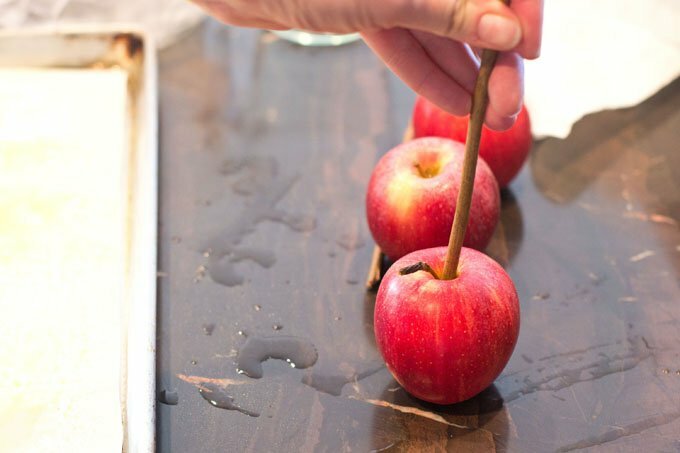 Tilt your pot to the side and hold the apples by the stick to roll them one at a time in the mixture. Be careful because that sugar syrup is seriously hot. After rolling the apple around, hold it up over the saucepan and shake it gently to let some excess syrup drip off. Then put the apples on your prepared pan to harden. They’ll be hard and ready to eat within 10 minutes. It’s kind of amazing how fast it happens. And it’s amazing how good they taste! If you want to print out these instructions, click print in the recipe box below. 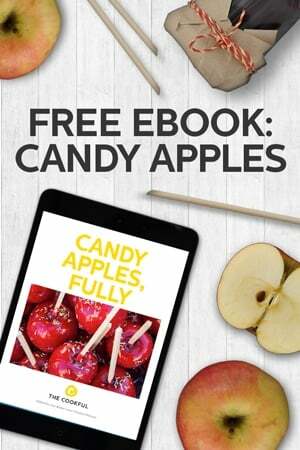 Or you can get the instructions and all kinds of other candy apple tips, tricks, ideas and recipes in our Candy Apple Ebook here. 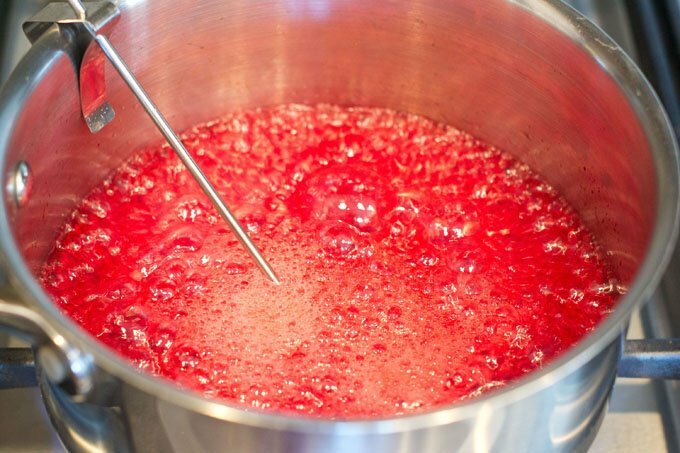 In a heavy-bottomed saucepan mix together sugar, water, corn syrup, food coloring and extract (if using). The mixture will be bright red. Set up your candy thermometer so that the tip is in the mixture and is not touching the bottom of the pot. Put it over high heat and bring it to a boil. Leave it bubbling on high until it gets to be between 300ºF and 310ºF. It will take around 20 minutes but keep your eye on it. It gets really fast at the end. 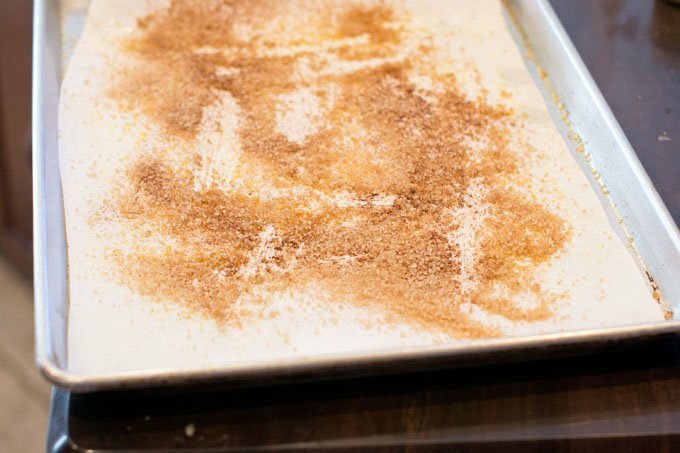 While the sugar mixture is coming to temperature, line a baking sheet with parchment paper and spray it with baking spray. Wash and dry your apples. Stick the sticks down into the tops of the apples. You want to get a good ways in. If your sticks are long, go all the way but not through the other end. If they're shorter, getting halfway into the apple is good enough. 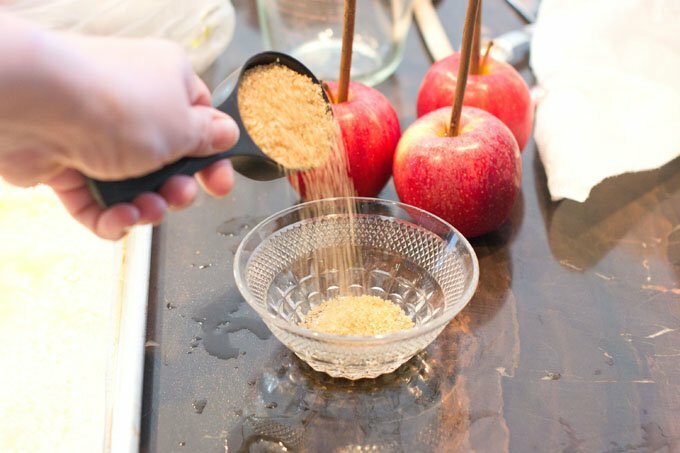 For sparkly apple bottoms, mix together 1/4 cup demerara sugar and 1 teaspoon pumpkin spice (you can leave out the pumpkin spice if you want. What's crucial is the sugar). Sprinkle the sugar mixture onto your prepared pan. When your candy mixture is at 310ºF, take it of the heat. 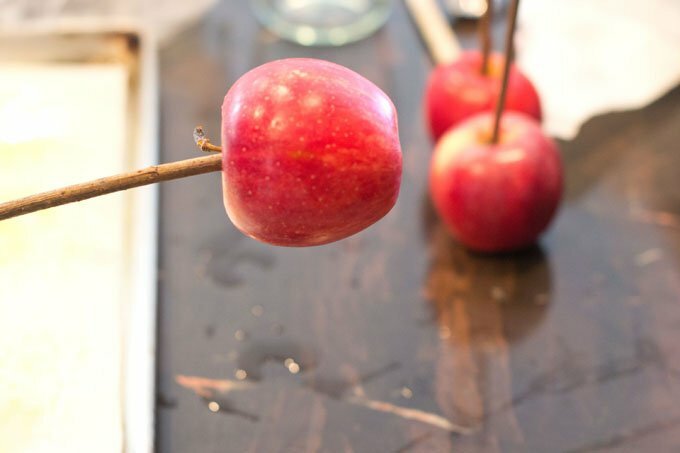 Tilt your pot to the side and hold the apples by the stick to roll them one at a time in the mixture. Be careful because that sugar syrup is very hot. After rolling the apple around, hold it up over the saucepan and shake it gently to let some excess syrup drip off. Put the apples on your prepared pan to harden. 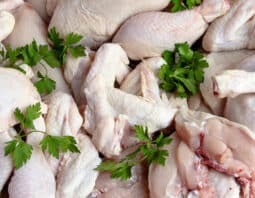 They'll be hard and ready to eat within 10 minutes. Video by Leigh Olson. 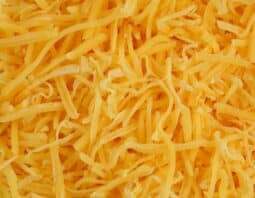 Article, recipe and pictures by Christine Pittman. 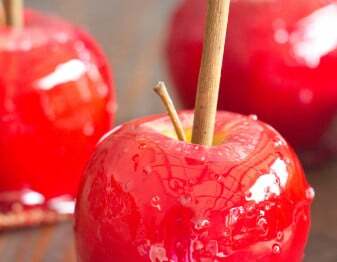 Pingback: What Type of Apple is Best for Candy Apples? Hello, Thanks for this. What if I wand shiny gold apples, do I just use gold food coloring? Denise, Yes, that should work. Just note that the color of the apply might shine through. If the color of your food coloring isn’t as deep as the red, you might get apple color showing through. You’d probably be best to use a green or yellow apple and the golden yellow food coloring. If you add white food coloring and the color you want the color of the apple will not show. Narissa, What a great tip. Thank you! 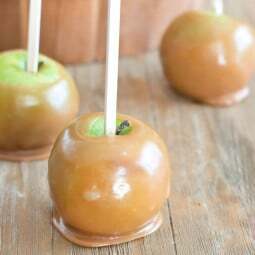 I need to make purple Candy apples, do I mix two colors or are there purple colors out there that I can get? The neon sets contain a purple. If you can’t find those, mix together red and blue to make purple. Sandy, do you mean that the coating isn’t setting and getting crunchy? My best guess is that your syrup didn’t get hot enough. It needs to get to 300F (150C). Make sure you’re using a candy thermometer and that the mixture gets hot enough before you take it off of the heat. I hope that helps. 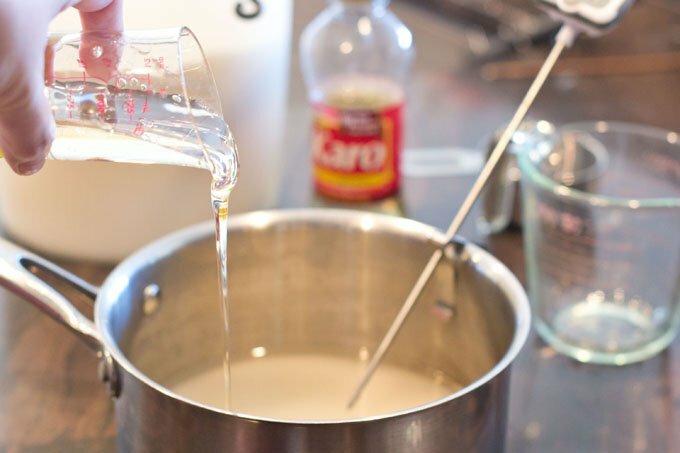 If you do not have a candy thermometer, use the spoon test by dunking a metal spoon in the mixture, if two balls form and drips separetly, then it is ready. Normally, I double this with the ice cold water test; have a small bowl/cup with cold water and ice, drip a small amount into the ice water, if it hardens and is crunchy then it has become hard candy and is ready to use, If soft, then continue to cook until it becomes hard as soon as it it hits the ice water. Thanks for the tips, Andrea! How do I get swirls on my candy apple? Stephanie, I’m not sure what you mean. What kind of swirls? Didn’t have enough corn syrup i double the recipe to 6 cups sugar and two water . Not enough syrup one cup help. Regina, I’m not sure how this would work out. I have only tried it as listed in the recipe. Ok im going to try to make them today because my grand daughters birthday party is tomorrow. Thank you,I will write back and let you know how it goes. Angela, I have never tried this. I honestly don’t know what would happen. Jorie, the purpose of doing that is to remove any wax coating that has been put on the apples. I have not found that the coating makes the candy less likely to stick. But I have read that that is possible. Some people just don’t want to eat that wax coating anyways. If you buy organic apples, they might not have the coating. They definitely won’t have a synthetic wax coating but they still might have a natural coating. Lisa, That’s really strange. The syrup is made of almost all sugar. I wonder what happened. Kristie, I actually don’t know what Henny candy apples are. Can you fill me in? I did a google search but didn’t really come up with anything. Thanks. 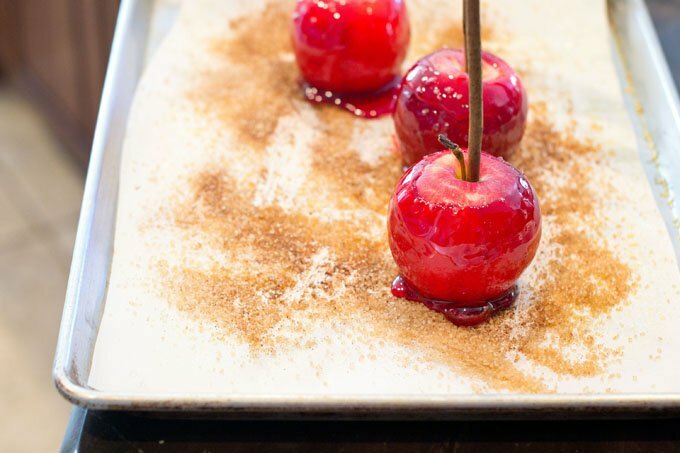 about how many apples can be coated using this recipe? Kelly, about 6 medium-sized apples, 12 small ones. Janet, The only thing I can think of is that the syrup is not being heated to a high enough temperature. 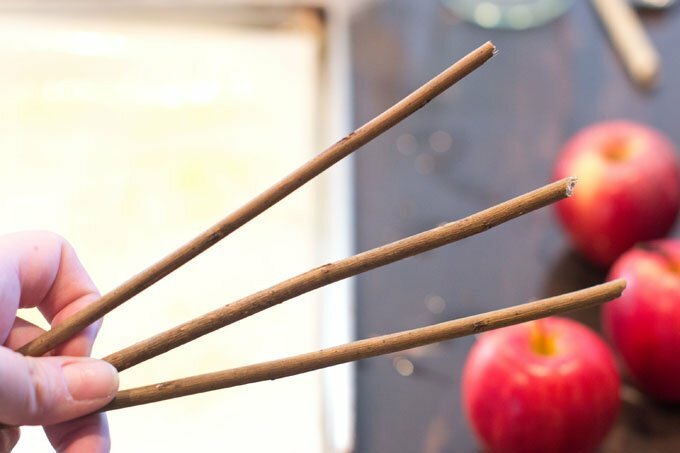 Do you use a candy thermometer? 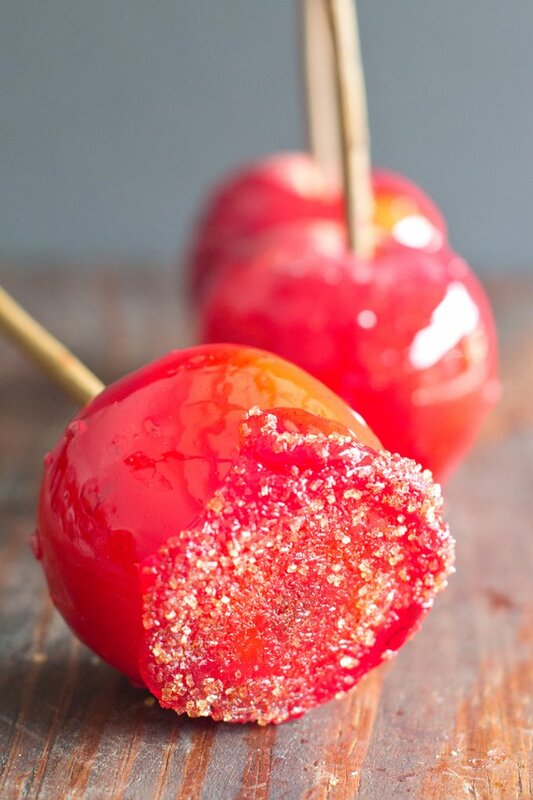 It needs to get up to 300 degrees F.
I love these candied apples!! I make them every year for Halloween. The kids in my rural neighbourhood Love them too!! Linda, Thanks for letting us know! How can I half the recipe ? I’m making color apples an I don’t need a full batch. Annie, The candy should set almost instantly and stay set at that point. If it isn’t setting, it’s possible that the syrup wasn’t cooked long enough. It needs to get to the hard crack stage, around 300 degrees F.
I just wanted to compliment your recipe in making candy apples. I followed the instructions to this recipe to the tee and I was very impressed. The candy crystallized just like the instructions called for. 300 degrees F and the candy is ready to be dipped in to. The taste was awesome. For a last minute sweet snack, this will do the trick. No need for purchasing the candied apple kit. Follow these instructions and you won’t go wrong. Raul, Thanks for letting me know. So happy they turned out well for you! why do my candy apples have bubbles? Jackie, Mine have bubbles too. I think it’s because the syrup bubbles so much as it cooks. You could try waiting awhile before coating the apples, giving the syrup a chance to settle down but not waiting long enough for it to set in the pot. Why does when I place my apples on wax paper they get stuck? Mesha, The wax paper should peel off easily once the candy has set. I’ve never had a problem with this but you could try spraying your wax paper with cooking spray before putting the apples on it as an extra help. 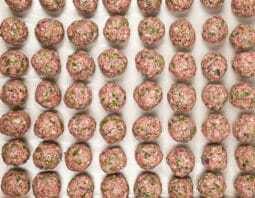 I do not have a candy thermometer – how do I know when the candy is cooked enough ?? You can run a little of the candy using a spoon under lightly rinning cold water to check for the hard crack dtage. I am trying to minimize how big and messy the bottoms of the apples become once they are dipped. Is it that im not letting more excess candy drip off before I place them on parchement? Sharkara, Yes, you can try dripping them over the pot for longer. Then hold them upright for a moment before setting them down. How long do these keep? Should they be refrigerated? Nicole, they’re fine at room temperature for a few days but they are best in the first 12 hours. I don’t refrigerate them. Yes. That information is given in the post above. I’m really not sure. I’ve never done this before. You could try making two separate candy syrups. Dip in one, let it dry and then dip halfway in the other. I’m not sure if the second dip would melt off the first dip but it might work. 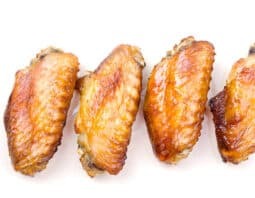 Can you substitute regular sugar for the demerara sugar that you sprinkle on the parchment paper and is this done to help prevent it from sticking to the paper? Kelly, You can omit the sugar. it’s just there because it looks pretty. I think if you used regular sugar it would instantly dissolve from the heat. We just made these, great recipe! It was very easy to execute (helps that I had a candy thermometer) why I don’t know lol I’ve never made candy before, ever. This recipe turned out perfectly. We did four large apples (picked from a local orchard) and one small already on hand. Even had a little left over for some small candies on the side. Fantastic recipe I will definitely be using this again. Tanya, Thanks for letting us know. So happy you liked it! What’s the best apple to use. What and where can I buy demara sugar? Hi my party is on Sunday can I make apples the Friday before. 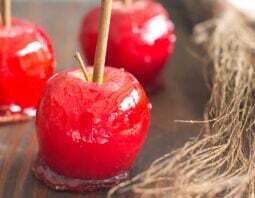 My candy apple don’t last, only a day are so, the candy falls off the apple when eaten it after a day.What am I doing wrong. They’re really best made on the day that you plan to eat them. Perfect recipe. My question is how do I clean out my pan. 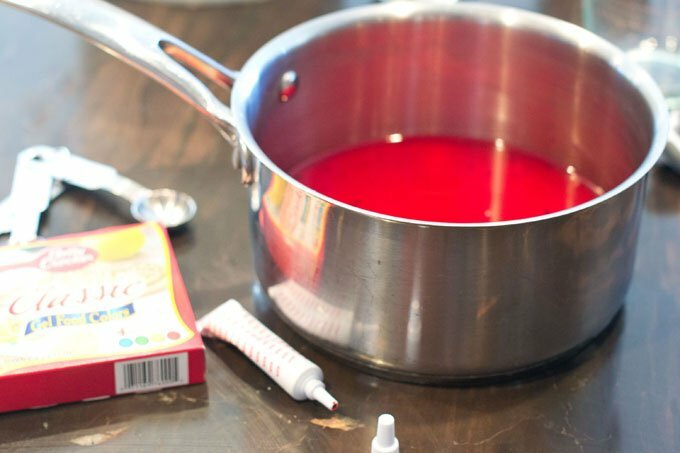 If the candy is hardened onto your pan, what you can do is add hot tap water to it and then put it on the stovetop and bring it to a boil. Then simmer it and scrape down the sides of the pan. Sometimes just soaking in hot tap water works but if not, then the boiling trick does it every time. How much candy do I need to make 20 candy @ a time? You would need to triple the recipe. If I was you though, I’d do the small batch of 6 first and see how it goes. Then if everything is going well, try doubling it and doing another 12. I’m not sure what you mean by soupy. It should be liquid. You dip it and then it hardens on the apple as it cools. Do you think you could put the mixture into a crockpot to keep warm and then dip the apples at a festival on the spot ? I really have no idea. I would worry that the candy would start to get hard. But maybe it would work. Sorry I can’t be of more help with this one. I’ve never tried that. Good luck! I’ve never done it but I’d say go with a lighter colored apple, like yellow (golden delicious). Then use lots of orange food coloring. 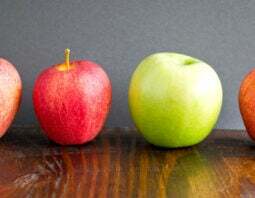 I think the yellow apple will interfere less (show through less) than a red apple would. Mine had a scorched odor when it hit about 250 degrees. I let the temp get up to 300 before taking it off. Would this be because the pan was not heavy duty enough? The syrup was not burnt on bottom. Peggy, If the syrup was not burnt, then yes, it could be your pan giving off that smell. Was the syrup still usable? 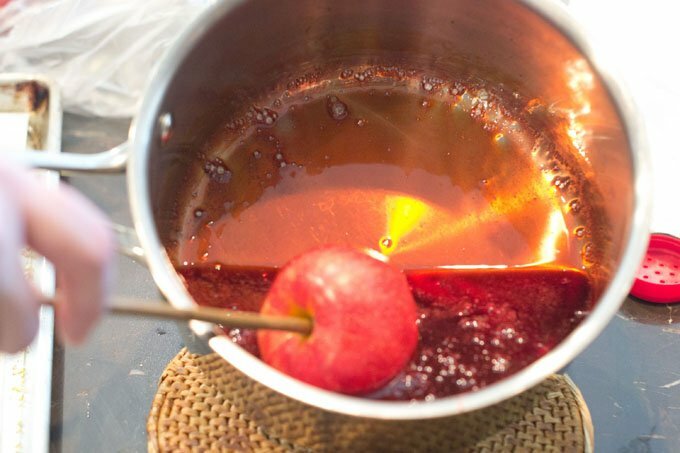 Question: how long does the hot candy liquid in the pan stay liquid — how many apples can you dip? Does the candy in the pot remain liquid for a while if kept hot? What temp should that be kept at? Do you keep it on warm so you can dip many apples? It stays liquid enough for the 6 apples in the recipe. I’ve never tried keeping it warm. I am cautious with heat and candy because it can change so easily.